The Monique Lhuillier Bridal Spring/Summer 2015 Collection, titled « My Ethereal Daydream », draws inspiration from John Singer Sargent’s paintings. Other John Singer Sargent-influenced collections : Dior by John Galliano Couture Spring/Summer 2008 (this show was partly based on John Singer Sargent’s portrait of Virginie Amélie Avegno Gautreau, titled « Portrait of Madame X »), Peter Som Autumn/Winter 2007-2008 (this show took inspiration from John Singer Sargent’s brush strokes), Prabal Gurung Autumn/Winter 2011-2012 (this collection was influenced by John Singer Sargent’s 1880 « A Parisian Beggar Girl » painting), Sue Stemp Spring/Summer 2009 (John Singer Sargent’s works were among the initial inspirations of this collection). 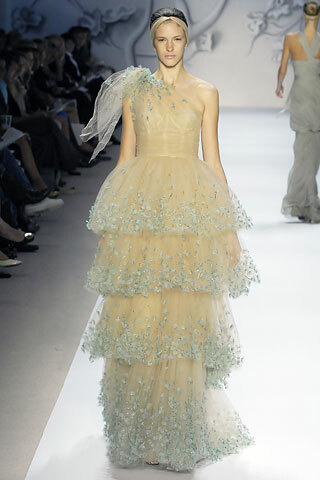 The pastel Ladurée’s macaroons inspired the colors of the Monique Lhuillier Spring/Summer 2008 Show. Other Ladurée’s macaroons-inspired collection, item or makeup : Louis Vuitton by Marc Jacobs Spring/Summer 2007 (Marc Jacobs took inspiration from Ladurée’s macaroons for the round small pieces which decorated the « Polka Dot Fleurs » handbag in this collection ; this inspiration process was filmed by Loïc Prigent for his « Marc Jacobs & Louis Vuitton » DVD, published by arte Video in September 2007), Mary Katrantzou Spring/Summer 2011 (the makeup of this show, by Val Garland, was inspired by a box of pastel Ladurée’s macaroons), Vera Wang Spring/Summer 2012 (Ladurée’s macaroons-inspired color palette for some pieces). Some Ladurée’s collaborations : Alexis Mabille (for Summer 2008, Alexis Mabille created « bowties » lemongrass, mascarpone and mint biscuits for Ladurée), Carven (in October 2009, anise and chlorophyll-flavored macaroons, which paid homage to Carven, were available at the Paris’ Ladurée Royale shop), Chantal Thomass (Chantal Thomass has created the black outfits and the aprons, with a polka dot pattern, for the waiters of the Ladurée’s store, on Paris’ Champs-Elysées), Christian Lacroix (for Christmas 2004, Christian Lacroix created rose and berries-flavored fluorescent macaroons for Ladurée), Christian Louboutin (3 boxes decorated with drawings of Christian Louboutin’s shoes and purses, and macaroons, including a figs and dates-flavored recipe Christian Louboutin inspired, created by chef Philippe Andrieu, were launched on September 11, 2009), Didier Ludot (in June 2011, the windows of his boutique, in Paris’ Palais Royal, featured 5 Dior-designed dresses, and pastries created especially by Ladurée, after the spirit of each dress), John Galliano (for Autumn 2010, John Galliano created for Ladurée rose and ginger-flavored macaroons, inspired by his « Parlez-moi d’Amour » perfume), Lanvin by Alber Elbaz (Alber Elbaz decorated boxes with sketches of women’s faces, and created 8 bubble gum-flavored macaroons for Ladurée, launched on September 25, 2012), Marni by Consuelo Castiglioni (chocolate macaroons, covered in gold paper, in boxes decorated with flowers and polka dots, were launched on December 1, 2009), Matthew Williamson (for Autumn/Winter 2011-2012, Matthew Williamson created for Ladurée liquorice and berries-flavored macaroons, presented in boxes decorated with a kaleidoscopic motif), Redline (for Summer 2012, Ladurée was one of the celebrities or institutions which created a jewel, in this case a bracelet with 5 « religieuse » charms, to celebrate Redline’s 7th anniversary, sold to benefit the Sidaction, a French association which fights AIDS), Sonia Rykiel (for Autumn/Winter 2005-2006, Sonia Rykiel illustrated the packaging of 3 organic chocolate bars for Ladurée), Tsumori Chisato (Tsumori Chisato created cherry blossom-flavored macaroons and a candle, launched in March 2012, to celebrate Ladurée’s 150th anniversary), Yazbukey (for Valentine’s Day 2010, Yazbukey designed a « small handbag »-shape box which featured 6 cherry-flavored macaroons, and for Autumn/Winter 2010-2011, Yazbukey created « cup » and « tea-pots » pendants for Ladurée). Moreover, Chantal Thomass, Christian Lacroix and Paul Smith were among the celebrities who confessed their love of Ladurée’s macaroons in the « Ladurée : Sweet delights / Ladurée : Fabricant de douceurs » book, published by Minerva, in 2006.